Andrew Mullaney is Chief Technical Officer and co-founder at NewsWhip. Andrew built much of NewsWhip’s original technical platform as the company’s first developer. He is now responsible for the management of NewsWhip’s technical operations and product vision, overseeing a growing team of software engineers, machine learning specialists and product developers building and maintaining the NewsWhip platform. Prior to co-founding NewsWhip, Andrew worked as a Technical Architectural consultant for Accenture in Dublin. 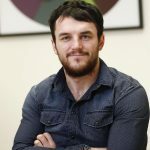 He also co-founded easydeals.ie, a website that allowed any business to create a geo-tagged profile and broadcast deals, sales and coupons to the online and mobile audiences.